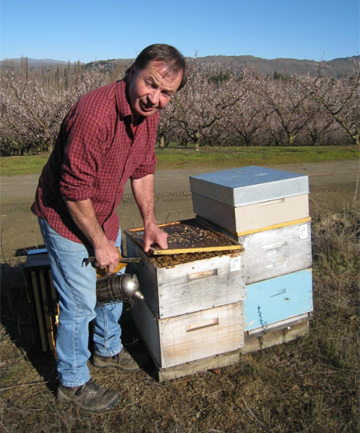 BEE MAN: Alexandra beekeeper Michael Vercoe tending his hives at a Central Otago orchard. Central Otago beekeepers are giving nature and bees a hand. In the spring, beekeepers like Michael Vercoe of Alexandra are kept even busier than usual, putting hives out in Central Otago orchards to pollinate fruit blossom. Since the varroa mite invaded the country in 2001, New Zealand’s wild bee population has been all but wiped out, along with close to half of our managed colonies. Believed to have originated in Asia, varroa mites are carriers for a virus that is particularly damaging to bees during their development. Infected bees will often have visibly deformed wings. Mite monitoring and knowing the hive are key factors in control. “Without us, New Zealand bees would die out,” Vercoe said. A beekeeper’s job is to optimise what bees naturally do. Vercoe has about 2000 hives on the go at orchards around Central Otago. In big orchards, he puts out five hives per hectare, for about 10 days, placing them in a warm, dry sunny position away from overhead sprinklers. It’s tricky this time of year with frost fighting when the trees get wet, because bees aren’t interested in pollinating dripping blossom, he said. Both beekeepers and orchardists also have to bear in mind that they need to position and encourage bees to pollinate the fruit blossoms first, before nearby willow trees start to bloom. Bees go after willows for the pollen, an early source of protein in the spring. So timing is crucial. Apricot trees get pollinated first, followed by plums and cherries. Getting this right is why Vercoe says beekeeping is not a lifestyle; it’s a vocation. Bees are good for orchards, but the irony is orchards are not good for bees because of sprays. The scientific name for the New Zealand honeybee is Apis melifera. New Zealand’s dependence on horticulture and agriculture means we may be more dependent on pollination from the honey bee than any other nation on earth. As of June 2013 there were 4279 registered beekeepers, 27,106 apiaries and 452,018 beehives in New Zealand. New Zealand’s highly sought after honey bee products earn about $81 million in exports, including $4m of premium organic honey. Honey bees contribute $5.1 billion to the economy, through pollination, along with domestic honey sales and exports, beeswax and exported honey bees. A commercial hive costs a beekeeper about $200 per year to maintain. A hive is inhabited by a different swarm every year; they’re not the same bees. A swarm is the bees’ natural way finding a new home; they’re not angry! Report a swarm to a beekeeper if the bees decide to occupy somewhere inconvenient, such as under the house or up a chimney. A hive needs 35-50 kilograms of pollen per year – that’s their protein. Beekeepers give them supplements. Honey is the carbohydrate component of their diet, but they need both pollen and honey. Bees are most active between August and May. They don’t hibernate over winter. There’s still plenty for them to feed on, such as gum trees and even weeds. 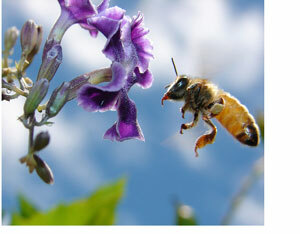 People can help increase the bee population by limiting the use of garden sprays. Farmers and horticulturists can also assist by keeping natural vegetation around their properties for the bees to feed on.